What a time to be a Tau player! 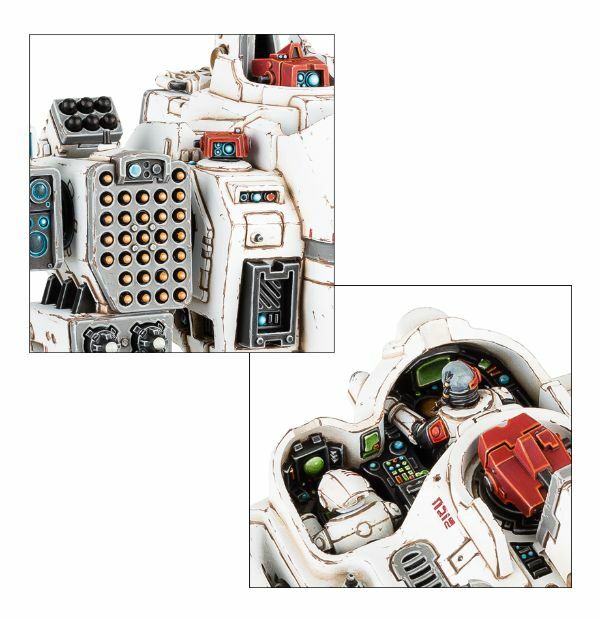 First we got the KX - 139, the first ground-based Tau Lord of War and now we get our first in-codex Lord of War! I am a bit late coming to the party, but here is the rundown and my thoughts on the newest Gargantuan on the block. In short, GW has given us our Lord of War and I am immensely grateful for what it is. Note, that does not mean I am buying it, read to see why. Despite being a Gargantuan Creature, it doesn't have the stats of previous Gargantuans. In fact, they are pretty terrible. They are almost identical to that of a Riptide, except it has 8 wounds instead of 5, it has a 3+ armour save instead of a 2+, and it has 2 attacks instead of 3. It also clocks in at 360 points base. As a Gargantuan, it gets all the added benefits that go with it, but still has no built-in invulnerable save. At T6 and 3+ armour, no invulnerable save is a pretty big deal. All things considered, it is probably a bit harder to kill than a stock Riptide, but not by much. So if the stats are bad, why is it 200 points more than a Riptide? 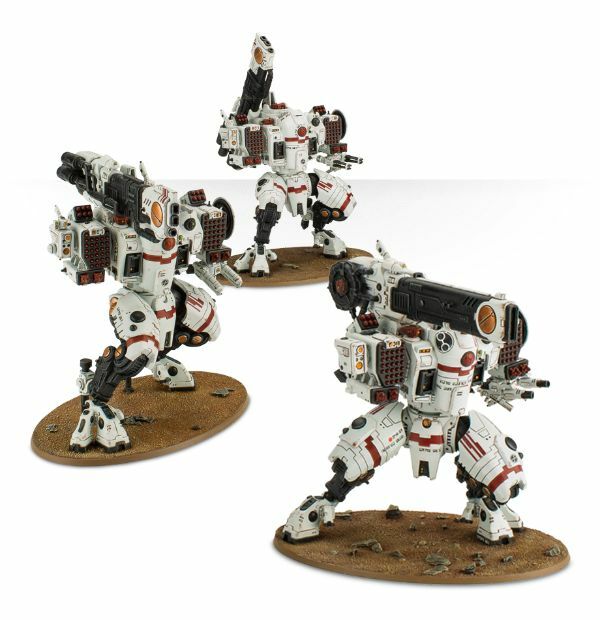 A few things make it better than a Riptide: Stomp, More Weapons, and its Stabilizing Anchors. It's Gargantuan, so it has all those rules. It's a Lord of War, so it also gives up extra VP for getting wounded. However, it has the Stabilizing Anchors rule. This essentially means that during your shooting phase you can anchor yourself. You can't move without losing the anchors, but you get to shoot TWICE from the next shooting phase onwards. So, in most cases, your opponent has 1-2 turns to kill the Stormsurge, depending on who has first turn, before its shooting potential literally doubles. This is, in my opinion, the only thing that could make the Stormsurge worth its price tag. Unfortunately, if you put the Stormsurge in your army, you literally have to build your army around keeping it alive for as long as possible, because without significant defensive measures, it will take most opponents less than one turn to kill it. So you need to be way inside the danger zone to get the two-shot D gun, but at BS3 you better have markerlight support if you expect to hit anything. With a maximum range of 30" and only AP3 outside of any workable range (AP5 most of the time) it is pretty disappointing, even if it does get 2 shots. The fact that the Storm Surge will almost always be wanting to stay put makes the short range that much worse. That said, dropping 4 large high strength blasts from turn 2 onward isn't something to take lightly. Against shooty horde armies like a Tau gunline or Astra Militarum it can get some work done. It is even powerful enough to make Reanimation Protocols less effective for Necron warrior blobs. This is the upgraded primary weapon and most believe it to be the auto-take for the Storm-Surge. With AP2 it is much better, and with Ordinance and S10, it is the next best thing to a D weapon. Another big thing is the range. This thing can actually stay put for a turn and still be in range of what it wants to hit. The obvious downside, compared to the basic weapon, is that it only gets one shot. Another weird choice, as it just brings more S5 AP5 to the table, like Tau needed it. In addition, it isn't twin-linked and has a variable output of shots. I hate variable output weapons, but at 4D6 you can probably count on it to give you at least 12-15 shots. It has a bit more firepower than a full Fire Warrior team, but not much. Once again, you need to refrain from moving if you want to get a decent amount of shooting out of this weapon. Twin-Linked Smart Missile System: nothing new here, unless they change the SMS profile in the codex. Twin-Linked Flamer: useless. At least we can pay a few points to upgrade it to the TL Burst Cannon. But for the same points the TL Airburst Frag Projector is Waaaaay better. Unless, of course, they make major changes to the profiles of some of these weapons. 4 Destroyer Missiles: Finally, another missile type! It is similar to a Seeker Missile, but it has AP1 and doesn't have the 'laser lock' special rule. Pretty nice one-shot weapons. They definitely require a couple markerlights to be reliable, and since they are one-and-done they don't benefit from the Stabilizing Anchors whatsoever. 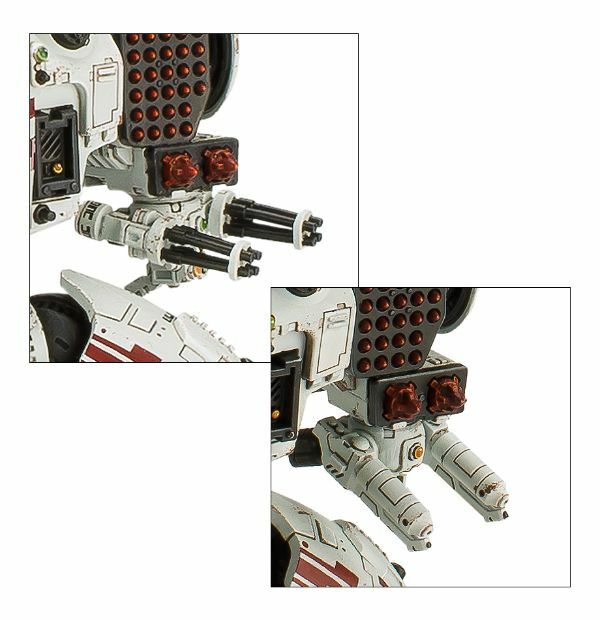 We can't be certain what Markerlights will do, or if they are even comparable in cost in the new codex. Markerlights could make this thing awesome, but only against a couple targets at most. We do not know what "support systems" are available in the new codex, what their point costs are, and whether they are even allowed in this suit. 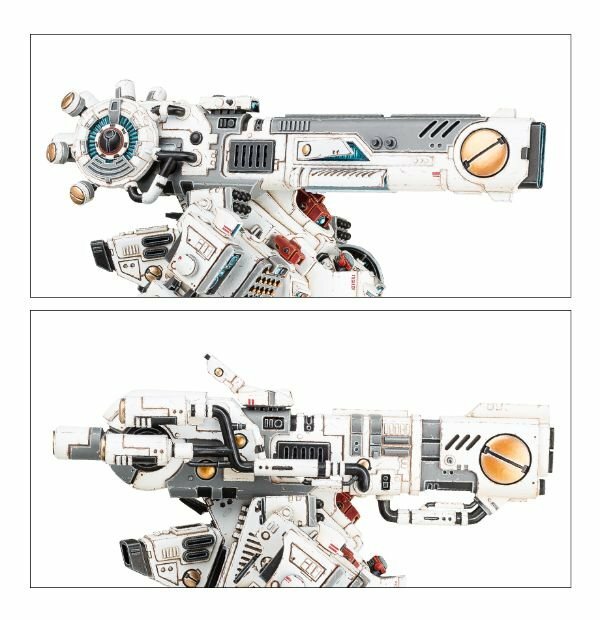 In the previous Codex, the Riptide wasn't allowed certain systems and had higher costs for others. It is entirely possible that this suit can take a shield generator but it could also cost quite a few points. What we do know is that it can take at least 3 support systems, so we could be looking at some new systems altogether. On its own, it is a pretty terrible Lord of War, but it isn't nearly as overcosted as some other Lord of War out there. If you can build your army around it, keep it safe for a couple turns, and get a board that is light on the terrain, this thing could be a rockstar. However, if you end up on a table with lots of los-blocking terrain, you'll be pitching fits trying to get your points back from this beast. I believe, that in today's gaming climate, you should only consider this model/unit if you are willing to go an entire game without using the stabilizing anchors. If you think you can win, and get good mileage with this guy when he is on the move, then he will work well for you. If your entire battle plan hinges on this thing surviving two turns AND not moving, you are making it easy for your opponent. Since I think this thing needs to stay on the move to keep its firing lanes open and to stay out of close combat, I am actually fine with the basic primary weapon. When moving the shorter range isn't as big of a deal and you'll still get two shots out of it. If something big, like a Knight, gets close you can move 12" and shoot 10" for 2 D strength shots. With some decent markerlight support (an absolute mandatory inclusion with this suit) you could put a nice dent in it. You can't help but notice some weird stuff going on with this model. I thought I would jot down what I thought was odd and perhaps they will make sense when the new codex drops. There is very clearly a shield generator on the model's left side. 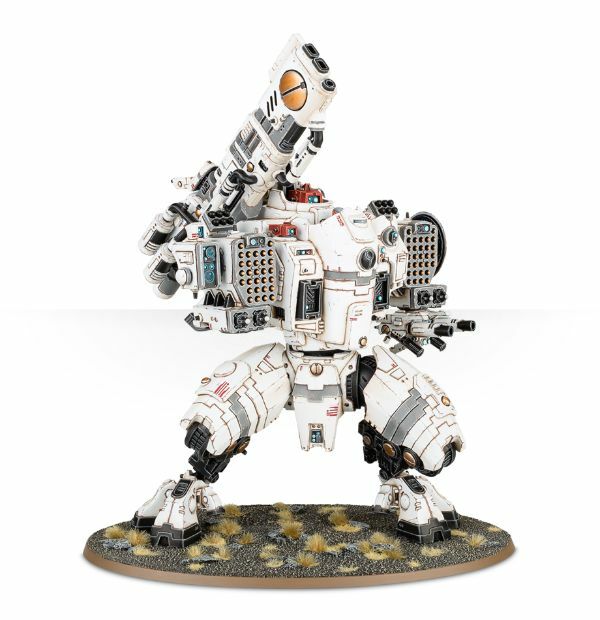 As someone who constantly fights Grey Knights with my Tau, I think I may have to add this to my army. I see it as not really fitting in with the Tau style, but it seems to help balance out the incentives for the enemy to just get close and win. I think keeping with the basic weapon load out and staying mobile will be the key here. Use Farsight enclave CTs as your troops and main support. Stay on the move, move together and make the best use of support fire. Three 11 man pathfinder squads, two Riptides, 4 CTs and a Good Commander and you are talking scary in a realm of unknown.